Momohime is The Best Muramasa Demon Blade Figure! I want to talk about the best Muramasa Demon Blade figure. 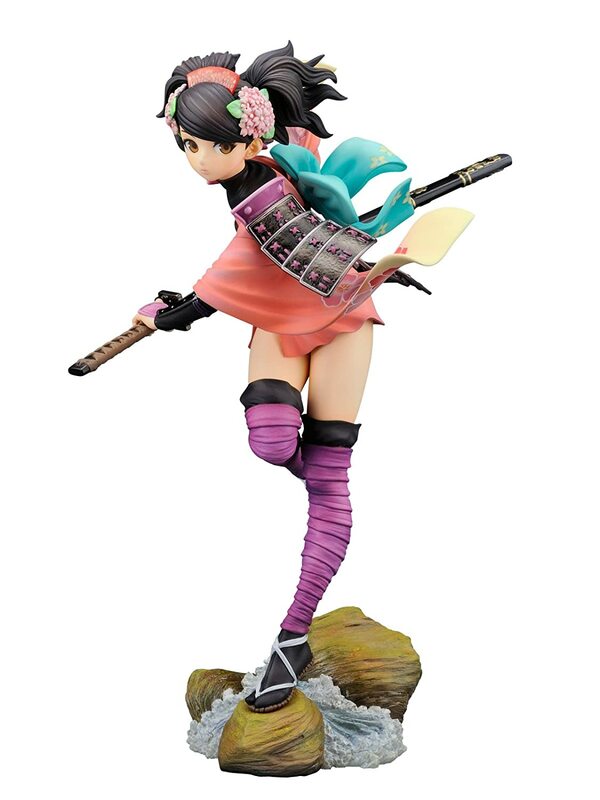 Muramasa The Demon Blade is one of my favorite games and Alter made a wonderful statue of Momohime. She is 1/8 scale. Even if you’re not a collector and just a fan of the game, Momohime is worth getting. Why choose a Muramasa Momohime figure? Of course, I had to talk about Momohime as a figure. She is from one of my favorite games: Muramasa the Demon Blade. In fact, I’m listening to the soundtrack to it as I write this. Great gameplay, music, art style, and characters! If you’re interested, check out the game right here! I love that she looks just like from the game. Alter didn’t skip out on any details. The base looks like the flowing river area of the game. Even her sandals have detailed bottoms to them! The figure comes with a replaceable arm piece, a cool base, a sword and scabbard, and of course Momohime. You can switch out her arm for different poses! I love that she has interchangeable parts to customize. You can adjust the pose of Muramasa Demon Blade Momohime slightly by switching out her arm to either have her sword sheathed or out. It’s great that you can customize the figure even if it’s just a little bit. I love that the base is just like a flowing river with rocks, it fits so well with her character. Just like I mentioned above there is a river area in Muramasa the Demon Blade that has rocks looking just like this base. I love when a figure can be integrated into an environment in this way. All of the little details like the flowers in her hair and the colors of the figure stand out. Even her pose works well to the theme of her being a ninja. She’s skipping on the rocks with ease. I dislike that the sword can be a little difficult to fit into her hands and changing the parts are a little hard sometimes. But once you get it how you like it, it looks great. The only other thing I think they could add to make this figure even better is Momohime’s blue soul on the side or something. It’s still great as is though! They need to make another Muramasa figure now! Kisuke is the other main character from Muramasa the Demon Blade. I hope they make a Muramasa Demon Blade figure for him at some point! In the mean time, I highly recommend you check out a few of these other awesome figures like Swamp Witch Metalia or Yoko from Gurren Lagann.